About six weeks ago, Amanda wrote a great blog post about her company – OpenView Venture Partners – and how they effectively used a blog to increase their organic traffic. Amanda’s post appeared on The Content Marketing Institute and it covered the lessons she and her partners have learned from blogging. It’s really a great post. It’s easy to tell that Amanda is very smart and perceptive about her company’s blog. It’s sounds like The Open Marketer is going to continue expanding a great resource for marketing insight. Since we started blogging in September 2009, our blog and main website regularly attract over 2200 unique visitors each week. This is quite a boost from our old web traffic statistics. For example, before we launched our blog, we averaged about 600 unique visitors to our site per week. This a great example of how a long-term blogging effort can lead to an increase in qualified traffic to a business website. Amanda shared 7 lessons with readers she and her co-workers have learned while blogging for their business. I thought we could highlight a couple of my favorites and expand on them. It’s worth your time to read all of Amanda’s insight into each of the lessons. Commitment to blogging needs to come from the very top of the organization. Blogging is a big commitment – larger than most companies initially realize. It takes time to research blogging topics, gather information, and to write blog posts. Beyond this it takes effort to promote the blog, get active in social media, and participate in your industry’s blogosphere. These are all essential aspects of blogging that need to occur in order for a blog to become successful. A company’s direction and big picture vision come from the person in charge. The CEO and president of the company needs to provide a solid vision employees can follow as they perform the essential daily tasks to strive for the vision. Blogging can start as an idea from anyone in the company, but the main leader and other leaders in the company need to commit to blogging for the long-term. Without commitment from above a blog likely stands no chance of succeeding. Solid companies develop a customer profile. This process often works the target customer down to an individual person. This person has a name, hobbies, background, the whole shebang. Having a specific person in mind when conducting business makes it easier for employees to think of someone specific when making decisions regarding their products and services. The same is true for blogging. Create a specific reader. Name this person. Give them a face. Write down their hobbies and interests. Even write a background of this person. This process will make it easier for you to write blog posts. Will you have more than one kind of reader? Of course. But you can’t please everybody. Write for one person. It works. In order to optimize your blog for search you need to write about what your customer is searching for. Thankfully Google shares this information with anybody that wants it. The tool is the Google Keyword Tool. It’s a blogger’s best friend. When you have a general concept for a blog post head over to the tool and search for 2 or 3 word keyword phrases that cover your idea. Once you have a few results be sure to scroll down the page. On the left side of the page be sure to select “Exact”. This will give you the exact traffic for each of the terms. Look for keywords that make sense for your blog post idea. Make sure it has some kind of traffic – I usually look for 500 (Global or Local) or more per month. Also be sure the term isn’t too competitive. The competitiveness is for paid search but if a term is competitive for paid search you can bet it’s competitive for natural search. Let’s say your company makes Booby Traps. 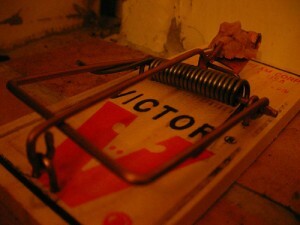 You want to write a blog post on booby traps. You do your search and find out that “Booby Traps” has 1,000 local monthly searches (local is US). There is also relatively low competition. This is a good term. The URL for your blog post should be something like http://boobytrapmanufacturer.com/blog/booby-traps/. When using a blog writing system like WordPress you can control the bold part of the URL. Next put the term “Booby Traps” early in your title. Easy enough. Next have an entire section of your blog and name the heading “Booby Traps”. Use an H1 or H2 tag. These three things will let the search engines know that your post is all about booby traps. Doing these three things along with sharing great insight and knowledge within the post will make your post optimized for search. As your blog ages the search engines will place more authority with your site. Posts like this will start popping up for the terms you’re targeting. Have you been able to get commitment from the leaders of your company to start a business blog? If you are the leader of a company, what are the questions you have regarding business blogs?